Whether you are buying shoes, an apartment or a pair of trousers, you have to figure out what you want and how much you have to spend to get it. Same applies to financing a wedding. You have to set your expectations accordingly. The average wedding cost is about $31,213. But just how much is the average cost of wedding meal each person? The most expensive part of any wedding is ensuring all your guests are well fed. You should expect to spend $30 per plate for every individual that attends your wedding. However, be ready to spend even more if you are planning a fancy wedding. The cost can go up to $350 per person. 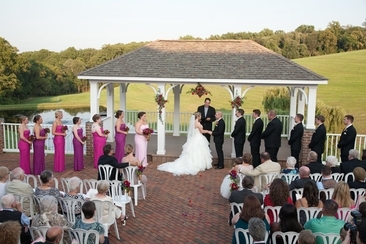 This cost will also vary depending on the location of your wedding since the costs are different in different states. Costs are usually 30% higher in bigger cities and on the West Coast and Northeast. According to The Bridal Association of America, the average cost of wedding meal each person is $85 including food and service, cake and cake cutting fees, drinks and drink service. The number is calculated based on average number of guests being 150, and wedding caterer charging $12,790. The first catering option is inexpensive. It may be a barbecue, a private room at a Chinese or any other casual food joint. It can cost as low as $20 per person without alcohol. Most restaurants will charge a small fee for a room but offer utensils for free. The cost could be inclusive of a simple meal served in family or buffet style. The average cost of wedding meal each person for a buffet or hors d’oeuvres reception without cocktail hour and a limited bar ranges from $30 to$70. It includes salads and hors d’oeuvres served in stations or buffet style plus a bar serving only wine and beer. You could also opt for a sit-down dinner and cocktail at a fancy resort, country club or hotel with an in-house caterer included. 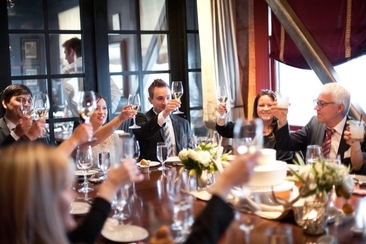 Here, the average wedding meal cost is between $125 and $350 per person or even more. This cost includes a sit-down multi-course meal, hors d’oeuvres, an open bar, service and gratuity. Your choice of either an outside caterer or an inhouse one should not affect your cost as much. The difference is in their billing, but the costs are almost the same. Usually, in-house caterers usually own the stemware and flatware, so they simply build in the price while outside caterers rent the utensils from a third party hence itemize them on your bill. Some caterers will leave the customer to decide on tipping up while others will add 15 to 25 percent gratuity to the bill. Remember to seek clarification regarding tax and tip being included in the bill or otherwise. 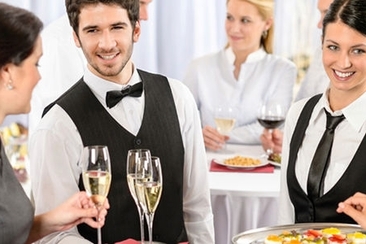 Unlike in-house catering which includes service, outside caterers will charge labor at about $15 to $25 per hour for each waiter and $45 for a chef. You may have to pay more for passed appetizers since they require more labor. There is also a possibility of being charged $1 or more corking fees per bottle of champagne or wine and $1 or more cake cutting fees per slice. Different caterers charge differently hence the importance to discuss all possible charges upfront. Note: It is important to discuss your budget with potential caterers before you commit. Avoid pricey add-ons like a variety of martini or a specialty drink bar if you are working with a tight budget. 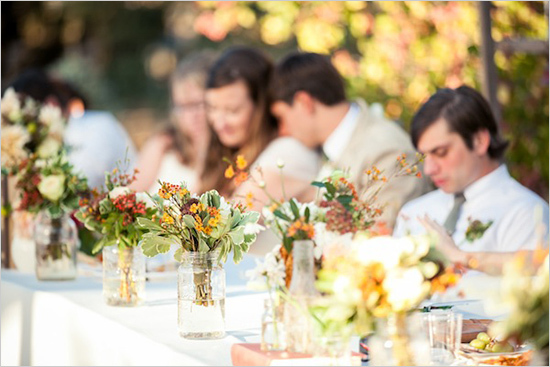 Are you thinking of how to lower the average cost of wedding meal each person? Holding a lunch reception instead of a dinner reception will come a long way to help you achieve this. The prices are lower because people take smaller portions. Guests also tend to consume less alcohol at lunchtime. Opt for a menu containing items that are grown locally and are in season. The food is not only fresh and tastes better, but you also cut a lot on the average cost of a wedding meal per person. Passed appetizers during the cocktail cost much less compared to a buffet. You may pay more for the service but spend much less on the food since you are able to control the quantities. People pick a piece at a time compared to filling their plates in a buffet. Culinary schools may not be conventional, but they are cheaper and serve splendid food. You could save up to 60% of your budget. A local trade school could, for example, charge $3 per slice of cake compared to $8 charged by the normal caterer. Stick to one main course. Avoid giving your guests choices. Go for two meals with the same price if you have to give options. Caterers will always charge the dearer option to cater for guests that change their mind at the last minute. How about sticking to a strictly no shot policy in case you opt for an open bar. This prevents people from ordering rounds for their table that they cannot finish. Time your meal such that it does not coincide with major meal times. You could serve a light meal or dessert only if your reception is at 3 pm for example. Be clear in your invitation to prepare your guests for what to expect. Another way to reduce the average cost of wedding meal each person is by having your caterers craft cheaper small plates for kids. Kids may not appreciate fillet as much as they would fish fingers! Consider buying your own beer to cut down the cost of wedding meal. Target discount clubs and try negotiating to have the store take back unopened bottles. Ask around for referrals to a good caterer. You can ask newly married friends, family members or other wedding professionals like photographers or bakers. Always interview several caterers before settling on one. Ensure the caterer you choose is licensed food server approved by your local or county health department. Be open to different food service options including food stations, buffet or full service keeping in mind the cost implications that come with your choice. We catered for 147 guests at a cost of $11,648.46. In total, we had five desserts and eleven different appetizers. The fee was also inclusive of two small bags of flavored popcorn that were served at a concert after the wedding. The menu included cilantro/lime chicken wrapped in lettuce, mini lobster corndogs, Caesar Salads, Soup Bon Bons, mushroom pie and Baja white fish mini tacos. Dessert included handmade dark chocolate peanut butter cups, Italian Valrhona chocolate cake, fresh fruits on skewer, lime cheesecake balls covered in white chocolate truffles and vanilla cupcakes. There was no wedding cake! We found a place where they serve a buffet including appetizers at $89 per person. This includes using the venue between 3 pm and 11 pm. They cannot sell alcohol, but we are allowed to bring ours. A local university’s catering service worked just fine for us. Instead of a large wedding cake, they made us cupcakes and a small cake using my recipes. It was a full buffet-style dinner that had two selections. Food was $12 per person for 150 guests while we bought our wine and beer for about $200-300. We spent about $600 in total for a wedding with 45 guests. We opted for self-catering with the menu made up of food that was easy to prepare in advance and reheat on the big day. We had pastry from a local bakery bagels and homemade quiche. There was also smoked salmon salad, fruit salad, country ham and a big cookie table. Another table had coffee, tea, apple cider, sparkling wine, orange juice and cranberry juice for guests to mix with their drinks. A friend made the cakes in different flavors including coffee cake with almonds, white chocolate cranberry, and pumpkin chai. We opted for a brewery as our reception venue. $850 was enough to feed 65 people. The theme was casual. The menu included jalapeno mac and cheese, tropical salad, pork sandwiches, smoked wings, and watermelons. It was cheap but crowd pleasing. Better than sitting down and chewing rubber chicken! Our catering costs came to $17,500 excluding alcohol but including tax and gratuity. We had an in-house caterer. We had 280 guests who enjoyed the food, and also had a food truck that brought a midnight snack although the guests were too full from the dinner. The place got is a public park in Brooklyn at $27,000 for 175 people. It is a three course with a cocktail hour and passed appetizers. The price excludes alcohol but is inclusive of rented china, eating utensils and soft drinks. 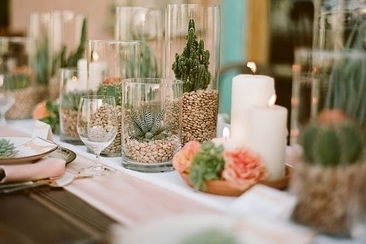 Looking for wedding place setting ideas for your reception but don’t know where to start? From rustic to whimsical we have different options for you. The rehearsal dinner invitations are sometimes an overlooked detail that couples rush to send out. Who gets them? What should they say? Find details and some inspiration for it here.